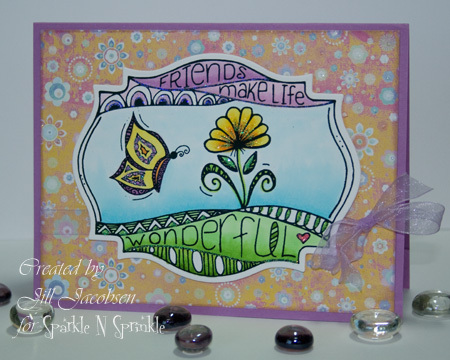 Shared Inspiration by Jill Jacobsen: Zendoodles! 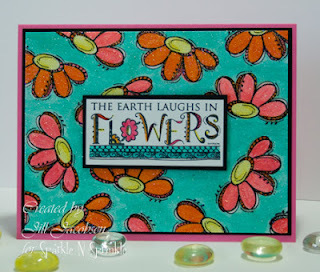 It's been a while since I've posted and today I want to share a sneak peek at some new stamps that I have made. 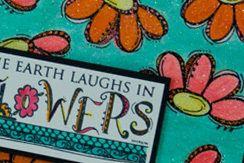 If you haven't guessed yet, I like Zentangles and I incorporated it in my stamps. I have a full stamp set, Zendoodle Flowers and Zendoodle Rainbow Stampette set. They should be released May 15th. They are fun sets to color with your Copics and the one image fits in the Spellbinders Label 18 Die. Check back again and I will post some more sneak peeks! Have a great weekend!! I know I will....Lexy was just crowned Prom Queen tonight....I'm so happy for her!! I can hardly wait for this set, Jill! It's wonderful, and so is your coloring! Love your color choices (especially the first card). The stamps look like so much fun - especially for those that are Zentangle-Challenged!! Your coloring is great on the first one and what bold colors on the second. Saw them both in person and they rock!